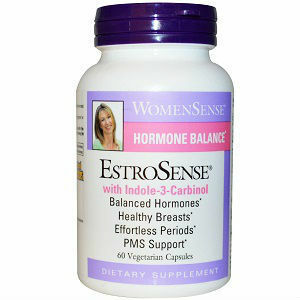 Claiming to balance hormones, promote healthy breasts, make periods effortless, and create PMS support, Estrosense provides women with a supplement that helps improve numerous hormonal elements which can disturb daily activities. Although this product can produce hormonal balance for many women, can it help those who are going through the stages of menopause? In order to answer this question, let us take a deeper look at Natural Factors’ product. Estrosense users are encouraged to take 1 capsule 2-4 times per day with food. There is no indication as to what time of day these capsules should be taken. While Estrosense does not mention any side effects associated with their product, reports show that some consumers have seen an increase in acne when using Estrosense. Estrosense can be purchased for $28.79 on The Vitamin Shoppe. It is also important to note that when customers sign up for The Vitamin Shoppe’s email list, they will receive a 10% discount on their purchase. With each purchase of Estrosense, customers will receive 60 capsules. Calculated with daily dosage, this is a 15-30 day supply. While researching information concerning this product, no guarantee could be found. This should be of concern to customers as there is no safety net for void results. After reviewing the researched information provided, it is easy to say that this product may not be the best supplement for women in menopause. The reason for this derives from the fact that ingredients known to help reduce the symptoms of menopause are not found in Estrosense. Therefore, it seems taking this supplement for menopause would leave users dissatisfied. Besides the fact that the ingredients could not help women in menopause, there are other elements which should concern users. First concerns the amount of daily pills. Taking the highest dosage, consumers will take four tablets throughout the day. This is a rather high number as many people cannot remember to take pills all throughout the day. Also, if the highest dosage is taken, consumers will have to repurchase every two weeks, thus resulting in users having to pay over $60 a month. Another concern is the lack of a guarantee. Guarantees create security factors for all customers. When a guarantee is not provided, companies are reducing the customers’ trust thus decreasing overall satisfaction. Jackie Horowitz	reviewed Estrosense	on April 9th	 and gave it a rating of 2.